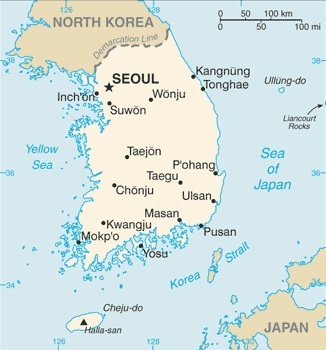 South Korea, formally the Republic of Korea (ROK) is a country in East Asia. It is one of two states located in the Korean Peninsula, the other being North Korea (the Democratic People's Republic of Korea), which South Korea borders to the North. Both countries claim sovereignty over the entire peninsula, and, although there is a ceasefire, are formally still at war ( tension bubbles up from time to time, and there are occasional military incidents, but open warfare between the two ended in 1953). South Korea is surrounded by seas on three sides. To the West is the Yellow Sea, across while lies the People's Republic of China. To the East is the Sea of Japan, across which lies Japan. To the South, is the East China Sea. The East China Sea and Sea of Japan are joined by the Korea Strait, which is the narrowest gap between Korea and Japan - just 120 miles (200 kilometers). As of 2007, South Korea had an estimated population of 49,024,737. Almost half the country's population, perhaps as many as 23 million people, live in the metropolitan area of Seoul, which is the country's capital and largest city. One of the world's most exciting and cutting-edge countries, South Korea is a fascinating East Asian powerhouse, where ancient temples rub up alongside dazzling technology. Be inspired to visit by the new edition of Insight Guide South Korea, a comprehensive full-colour guide to all that's weird and wonderful about the country. A new edition by expert authors. Stunning photography that brings this fascinating country and its people to life. Highlights of the country's top attractions, including captivating former capital Gyeongju, the Unesco World Heritage Site of Haein-sa Temple and the still-relevant DMZ in our Best of South Korea. Descriptive region-by-region accounts cover the whole country, from pulsating Seoul to the remote islands of the Jeolla Provinces.